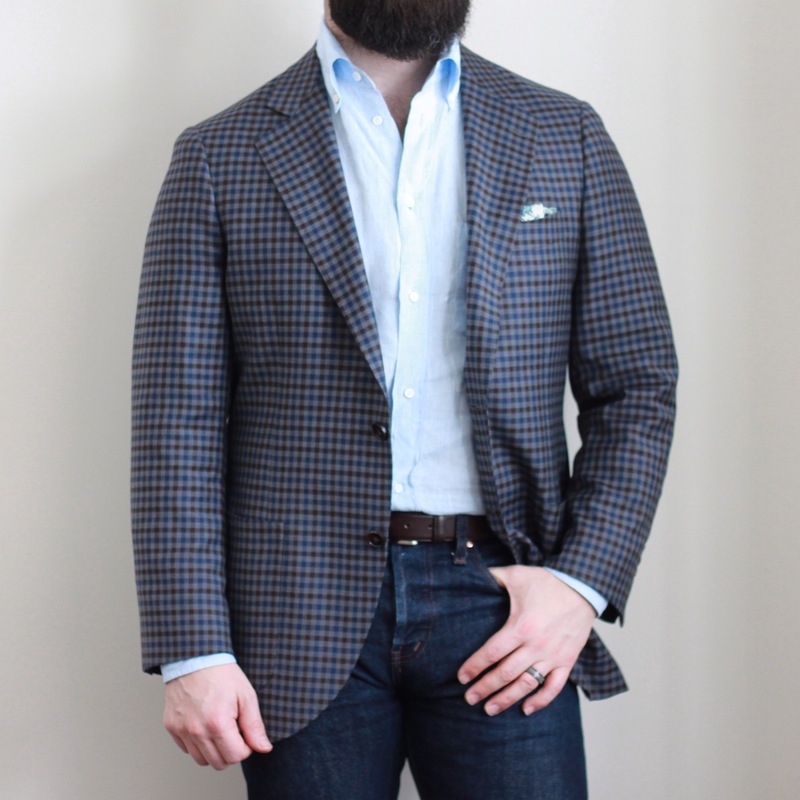 There are numerous blog posts about pairing sport coats and jeans. Reading many of them will tell you that your best bet is to go with a dark wash with minimal fades. I used to subscribe to that idea, but as I become more comfortable in my own clothes I’m not so sure. Why does it need to be dark wash? If you compare this idea to wearing odd trousers, it is often easier to pair darker jackets and lighter trousers. Why wouldn’t you want denim with fades? One of the wonderful aspects of nice denim is that it fades in high-wear areas, becoming a unique piece of clothing. This learning curve and continuing assessment of clothing combinations I’m going through makes these things more interesting. I feel that I’m at a point where I can put together a coherent odd jacket and trouser combination, but I feel a little uncomfortable with sport coats and jeans. It seems so easy to do in theory – just throw an odd jacket on over a button up shirt and denim, right? In my younger days, it even seemed cool to wear a hoodie under a sport coat *cringe*. I never actually attempted that. 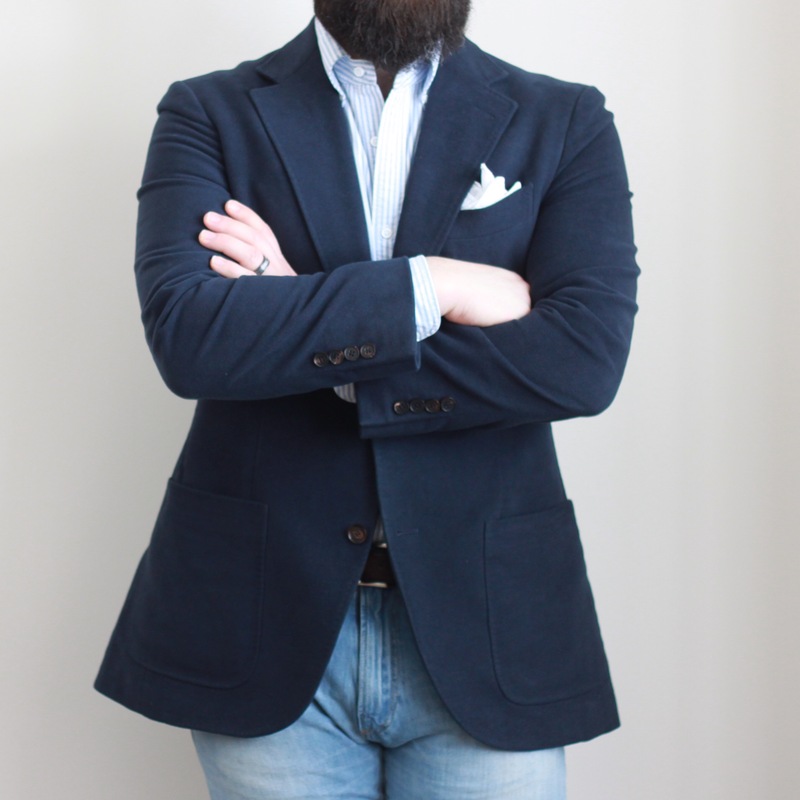 Armed with better contextual knowledge, putting together a coherent sport coat and jeans combination is not so simple. Ok, so what do I mean by each of those? Comfortable. Hopefully all your clothing is comfortable. What I mean here, is that the jeans shouldn’t be skinny, painted-on things, nor should they be baggy. Most men’s jeans are cut with a pretty low rise, but if you can find a mid-rise pair, they will look better with a sport coat. The issue with low cut jeans that sit on your hips is that you’ll get a billowy situation with your tucked in button up shirt. You’ll also have a bit of a balance issue – the waist of the pants will look off compared to the buttoning point of the sport coat. The jacket should be on the softer side of tailoring. Think patch pockets, lightly- or un-padded shoulders and the like. The last thing you want is to appear to be wearing denim with an orphaned suit jacket. 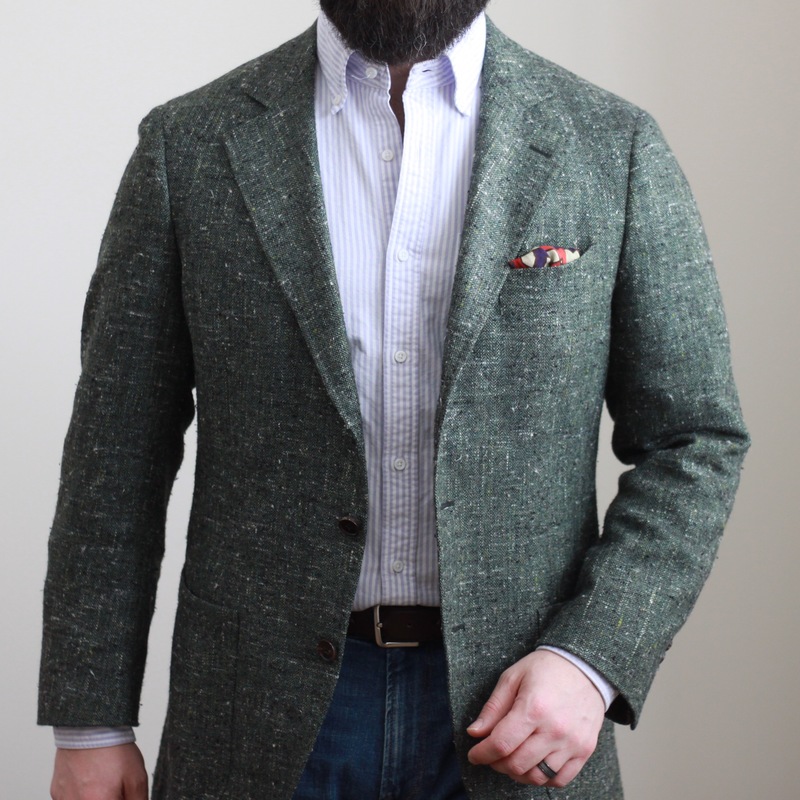 Another thing to consider with your sport coat and jeans combination – on this casual end of the spectrum something as small as not buttoning up the sport coat will help create that relaxed, louche vibe needed to pull it off. Fit – it’s been suggested a shorter, trendier cut can work with denim. Sure, I guess. To me, if you have a cropped jacket paired with low rise jeans, it’s going to look pretty off. Why try to make the denim something it’s not? Embrace the fact that you’re wearing jeans. Now, there shouldn’t be rips, tears, patches or weird designs on the jeans. But to me, fades are ok. Not crazy acid wash or bleach spots and fake whiskers. Natural fades though? Absolutely. I have three pairs of jeans – light wash from the Gap; medium wash from the Gap; tapered fit selvedge from the Unbranded Brand (UB201). The pair of light wash are terrible for wearing with sport coats. Low-rise, super stretchy and too tight. The medium wash are great! The athletic fit works well for me, and they have a mid-rise and nice colour, without heavy fake fades. The UB201’s are awesome. I picked those up for a steal on amazon.ca – every now and then they go on sale for around $50. For the fit of the jeans, I’d say it should be a conservative cut; not too baggy or too tight, and you want to consider the hem. I wouldn’t say it’s a rule, but I haven’t seen many sport coat and jeans combinations that I liked where the denim is cuffed. Not that it can’t work, I just think a clean hem looks more appropriate. So this means staying away from stacking the jeans. Footwear is important to complete the look. Often, if I’m wearing jeans, I’ll grab my Clark’s Desert Boots. But if I’m also wearing a sport coat, the boots feel clunky. They’re a great casual boot, but the last is round, and the crepe sole is a pretty casual statement. I basically have three pairs of shoes I’d reach for when I’m wearing denim and a sport coat: my dark brown suede loafers from Velasca, dark brown suede wingtips (also from Velasca), or my mid-brown wingtip derbies (Lombard) from Allen Edmonds. My suggestion would be to go for something with a sleek last shape, but without formal-leaning details. This has highlighted a bit of a gap in my shoe rotation: dress boots. I think for next F/W season, I need to start planning for picking up either a pair of chelsea boots, or some kind of brogued boot. A sleek last, with a rubber sole that isn’t too chunky. Something I can pair with my usual odd jacket and trouser combinations, but also with sport coats and jeans. Looking for some inspiration? There’s a great thread over at Style Forum that has some great discussion and lots of pictures. I’d also suggest giving @burzanblog and @nordinkent a follow on Instagram – both experts at pairing sport coats and jeans. How much thought do you put in to sport coat and jeans combinations?